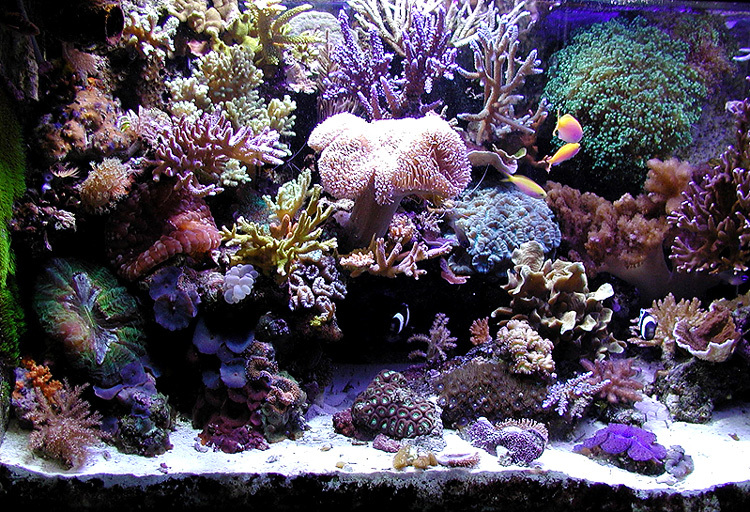 July 2004 – Richard shares his awesome 150 gallon tank with us this month. 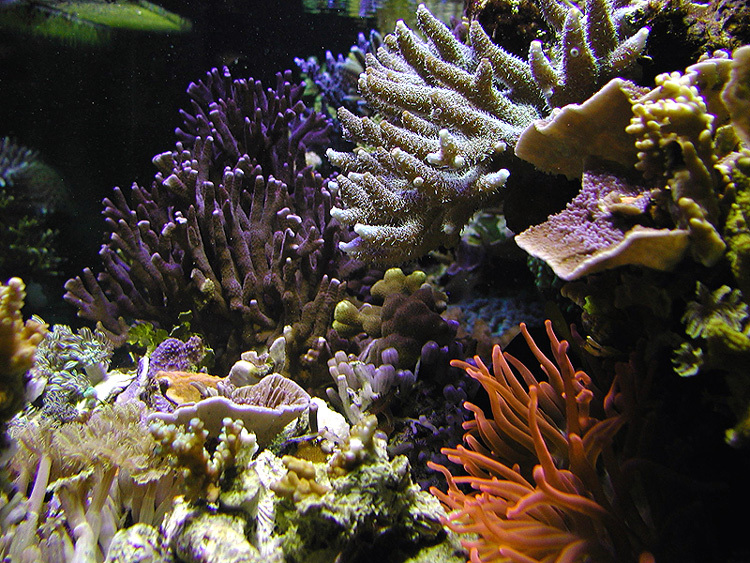 I began reefing in the 80’s when algae covered rocks were thought to look good and bio balls were the end-all of water quality control. After working in several LFS in LA for 5 years, I moved to the SF Bay Area and took a hiatus from the hobby. When my wife and I were lucky enough to buy our first house I jumped back in with a 50 gallon and labored to catch up with all the new information that had become available. I was very happy with the tank, but always thought about doing something bigger and better. Click here for a Shockwave time lapse of Richard’s tank. My chance came in 2002. My wife was pregnant and we decided to move a whopping 5 blocks to a bigger home that would better suit our growing family. And, of course moving meant NEW TANK. The situation worked out perfectly because we had two months to prepare for the move, and I was able to use that time to design and collect the components for the new system. Best of all, beneath the new house was a 40 inch crawl space with great access, so a remote sump was high on the list. Being on a budget, I searched the Internet for used equipment, and based my system around what I found. I knew I wanted a bigger tank, and soon I found a 150, 5x2x2, drilled with overflows and perimeter bracing (I love perimeter bracing because it allows you can put all kinds on stuff right by the tank where you need it). I also got a used Euro Reef CS-3, some used 250 watt DE pendants, a used Ampmaster 3000, and a used 180 acrylic tank for the sump. All these were significantly less money than the same items new, so if you have the time, searching for used equipment is the way to go. 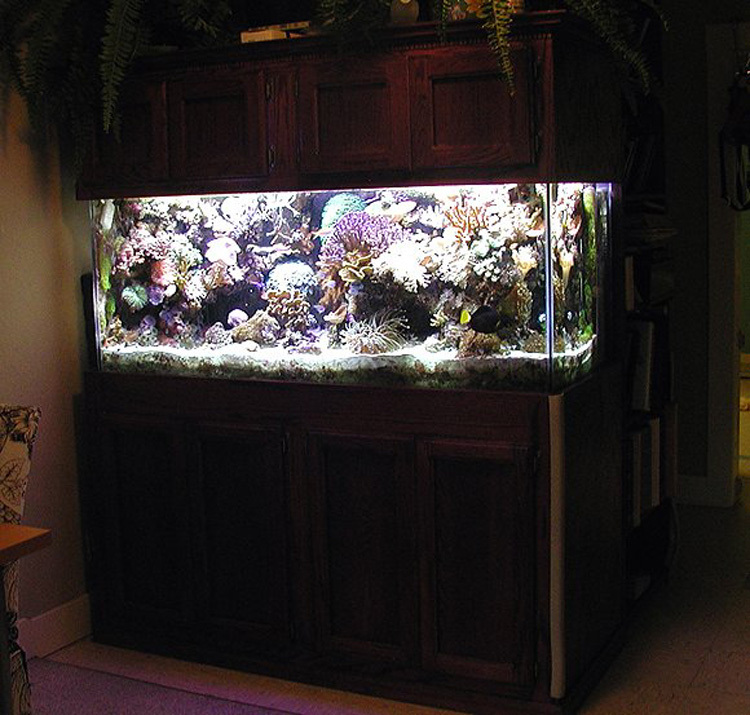 A custom-made stand and canopy were a must because the old tank was rigged with temporary solutions that seemed to always become permanent, and the room it was in was slowly taken over by the kudzu-like growth of reef equipment…it drove my wife crazy. The stand and canopy were the single most expensive purchase for the new system: red oak, 30 inch high stand, 16 inch high front opening matching canopy – mmmm pretty. I now completely believe that a good looking stand and canopy are a must because they make your tank look like showpiece rather than a cobbled together hobby. I wanted to locate the tank in our living room because that’s where I spend most of my relaxing time, but there really wasn’t a good place for it. I considered another room, but knew I wouldn’t be happy with it there. I posted diagrams of the house on RDO and asked for input. There was a perfect wall for the tank, but in that wall was a door to a bathroom. Someone suggested I move the bathroom door, an idea I never considered. This strategy had the added benefit of allowing me to access the back of the tank from inside the bathroom. So a contractor friend and I moved the door, reinforced the floor under the tank, and began the move-in. Set up for this system officially began in August of 2002. The first order of business was moving the old tank to the new house (the move actually went very well, only needing 2 friends and 20 containers for livestock…and the result was almost no losses). The livestock stayed in the 50 gallon until the new system was up and stable, which was pretty quick because almost all the live rock came from the old system and any new rock had been curing for months at the LFS. In the third week of August I moved a couple of LPS and softie frags over and they did well, so over the next two weeks I moved everything over. Two years later, the system is flourishing, (knock on wood, we all know how quickly that can change!) allowing me a constant stream of frags for sale or trade to other hobbyists. The biggest show tank possible. 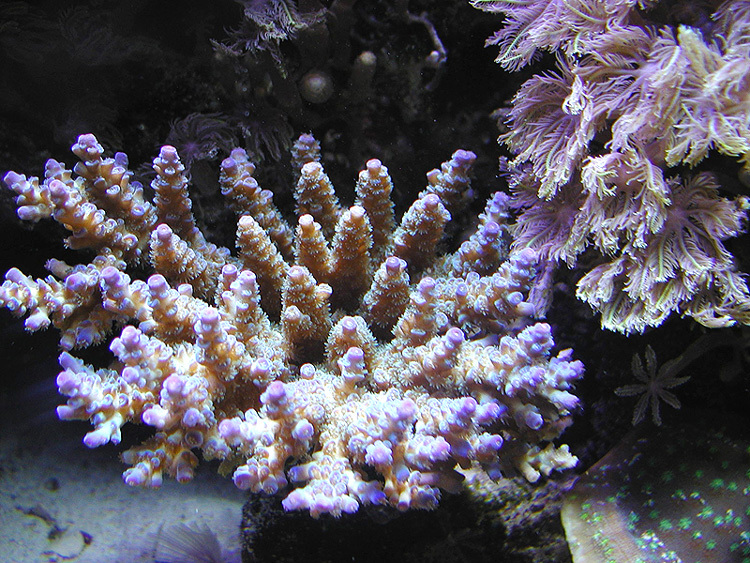 A big, remote sump for macros and coral farming. 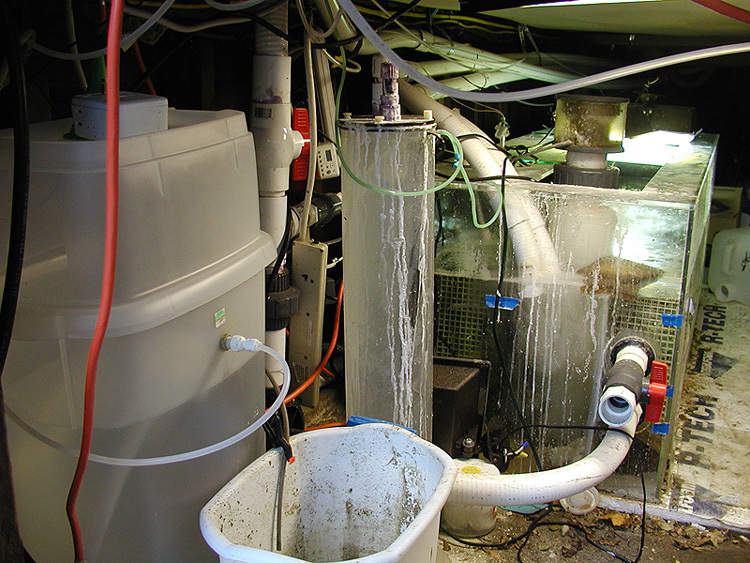 I think the benefits of a big sump are huge: stable temperature, stable water quality, hidden mess (which, from the pictures, you can tell is important) and no noise in the living room. I am currently thinking about adding a 300 gallon tub to the sump as cheap additional water quality insurance because I have the room under the house. 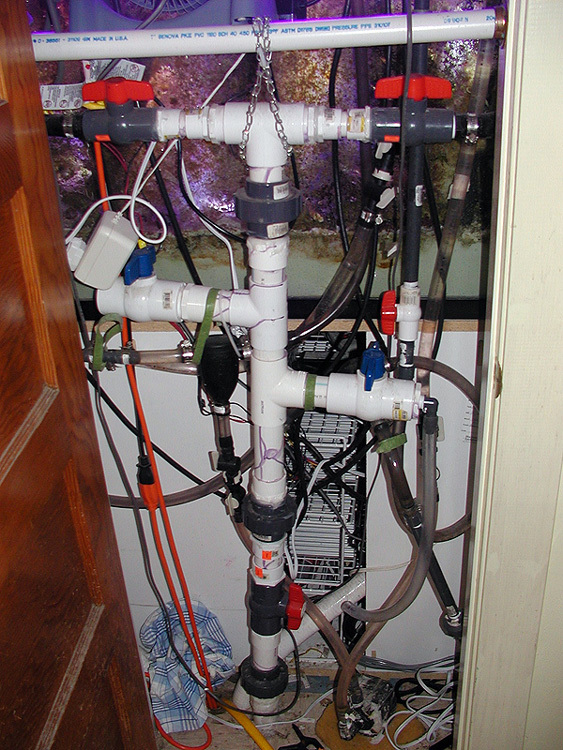 An over tank refugium to keep the in-tank supply of pods stable for the fickle fish. A medium sand bed mainly because I like the look of it, and I like the stability it provides. I also regularly ‘storm’ the sand with a power head to help remove detritus build up. A big skimmer running wet to take out the nasties quick. A calcium reactor for the stability and peace of mind. Good lighting that will allow the keeping of practically anything. High water turnover rate and strong, random circulation. 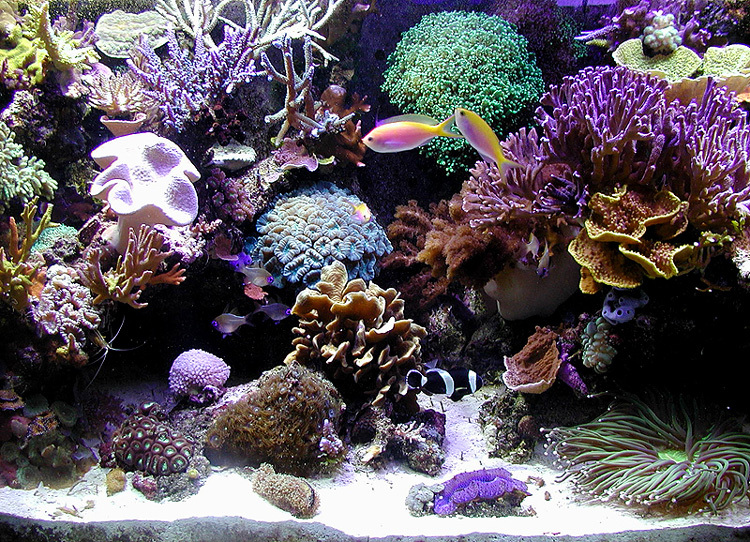 Automate everything possible – timers for lights, temp controllers for fans, auto top off, auto skimmer shut off – because it is more fun to look at your tank than to spend time doing menial tasks. 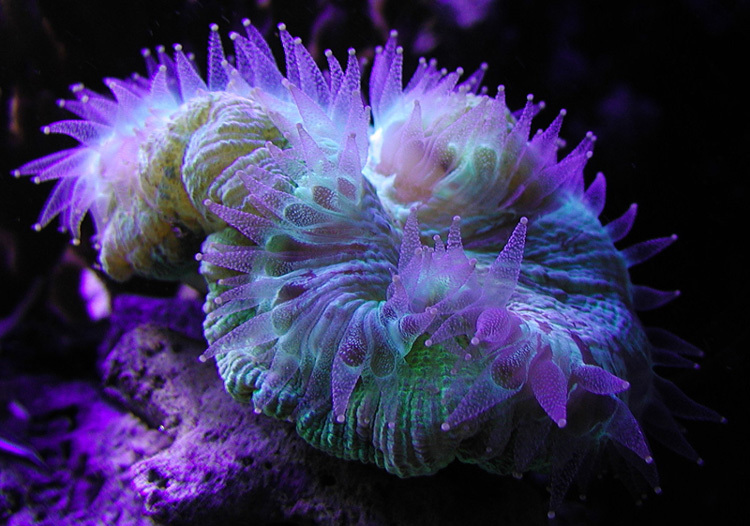 Ampmaster 3000 as return, feeding 2 1 inch Sea Swirls located in the front corners of the tank. Mag 9.5 on a SQWD closed loop, entering tank in the bottom back corners. The pipe into the tank can be rotated so the direction of the output can be changed. Mag 7 running a SQWD, one output to the above tank ‘fuge, the other I move around the tank depending on where I think more circulation is needed. 2 power heads on an MVT wave maker to eliminate dead spots, and one large power head, also on the MVT to act as a ‘surge’ across the top of the tank. Currently adding another Mag 9 and SQWD for additional circulation. The lights come on staggered. At 10:30 am the VHO’s come on, then the 20 K’s at 11:00 am. The 10 K’s come on at 2:30 pm and go off at 8:30 pm. The 20k’s go off at 9:30pm and the VHO go off at 10:30. The moonlight comes on at 10:30 and goes off at 1am. 2 350 Watt Won titanium heaters, one in an overflow, one in the sump. I am a little bit of a redundancy and anti flooding freak. My auto top-off has two float switches: one for low water, one for high. The return pump is on a float switch in the main tank in case the 1.5 inch overflows clog. The ‘fuge pump is on its own float switch and has 2 drains to the main tank, one above the other in case of clogging. DIY skimmer auto shut off, so the skimmers stops foaming when its external collection container is full. All power cords are clearly labeled; so it is easier to trouble shoot something over the phone. My one vulnerability right now would be in case of a catastrophic power failure. Eventually I will acquire a generator of some kind; in the meantime, I employ several Penn Plax battery powered air pumps on the tank and the sump that kick on if the power goes out. I also have a 600 watt inverter in case of longer outages. 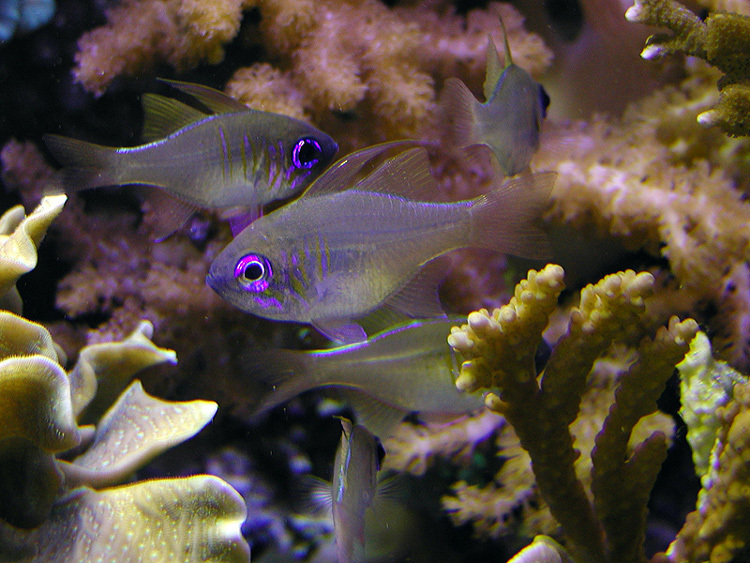 I feed PE mysis and Cyclop-eez every day. I occasionally feed Golden Pearls and flake food. I’ve tried using other supplements, but was unconvinced by the results. 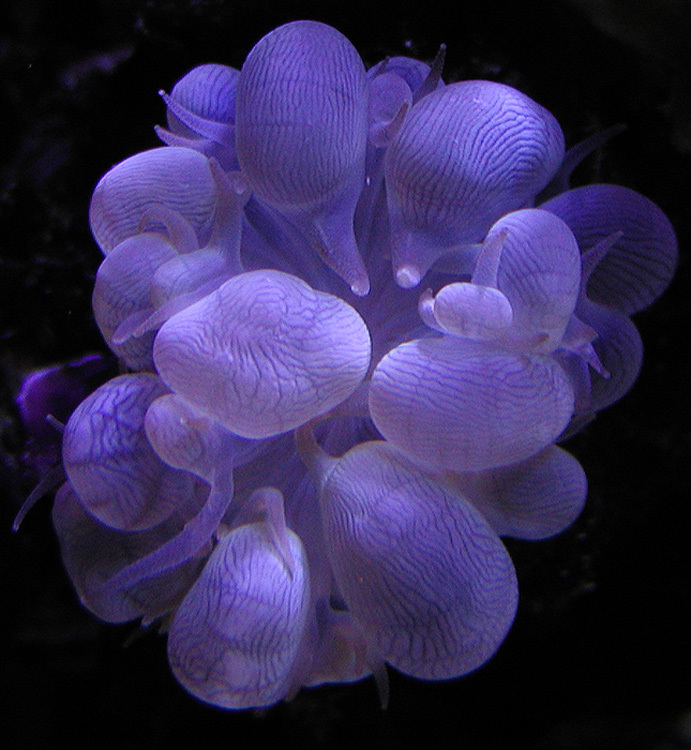 I clean the interior surface of the tank with a magnetic cleaner every couple of days using a magna scraper when coralline is present. 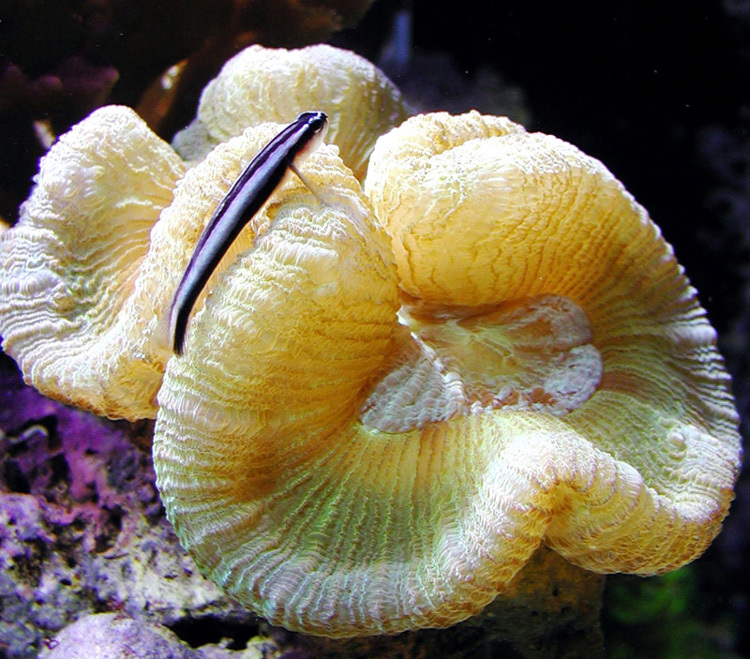 I use vinegar on a paper towel to clean the exterior surface of the tank, particularly if guests are coming over..
Once a month I harvest Macros from the sump. At least once a week I check to make sure that all the pumps the house and all the reactors under the house are working properly. I add some salt to the sump when the 5 gallon skim mate container is full. Due to the large volume in the system, I don’t perform regular water changes, and I do generally run carbon and at least one polyfilter. However, I will occasionally do a water change when I get worried, when I ‘steal’ water from this system for my other tanks, or if something looks unwell. The basic layout for the tank consists of two distinct pinnacles, with some shallow rubble between them. I arranged each pinnacle with multiple swim- throughs for the tank denizens, as well as overhangs and cavelets to shelter some of the shyer tank-dwellers. I use the vertical surface of the back and side tank walls for additional aquascaping, and to provide the illusion of depth of field. As the tank has matured, I’ve encountered the happy problem of having the space between the two pinnacles close organically. While this “crowding” disturbs my minimalist friends, I see the changing landscape in the tank as being part of the fun, and content myself with only minimal intervention. 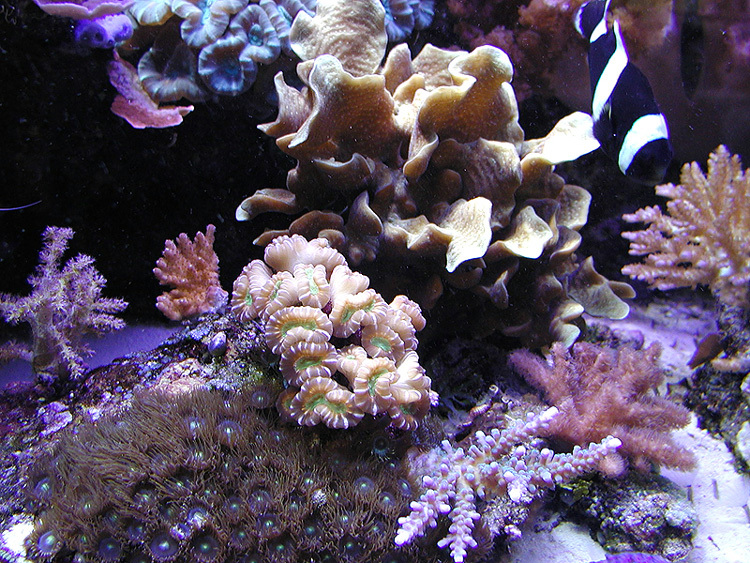 I do harvest frags when they threaten other corals, or when a colony simply gets overwhelming. But for the most part, I let them do their thing. Of course, when a cool new frag comes into my possession, I somehow always find a way to place it! I have also come to look forward to the occasional rock shift or slide, as it gives me the opportunity to re aquascape making me feel like the tank is new again. 7 blue eyed cardinals – the coolest fish ever! I decided not to clean up all my equipment before I took photos for this article. I am always more interested in seeing how people actually ‘work’ their systems than sanitized pictures for display. 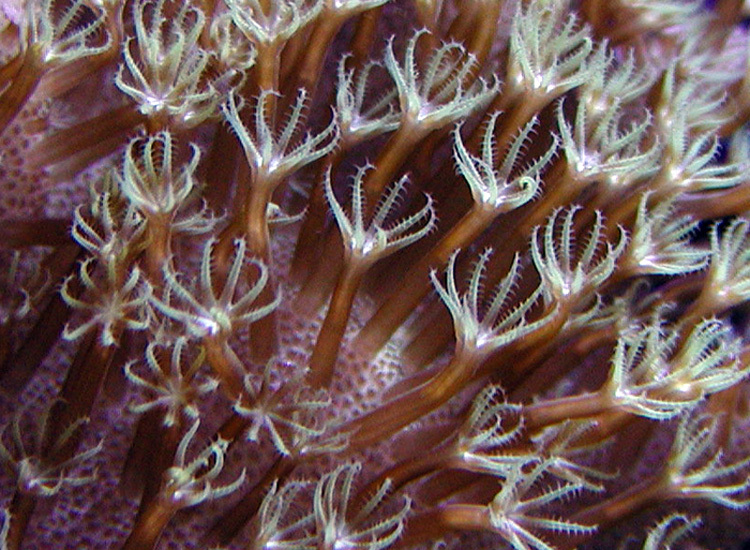 I am not a stickler for the Latin names of my critters, especially corals because they are so hard to id correctly – for instance, it looks like my “Bay Area” tortuosa is actually gomezi. 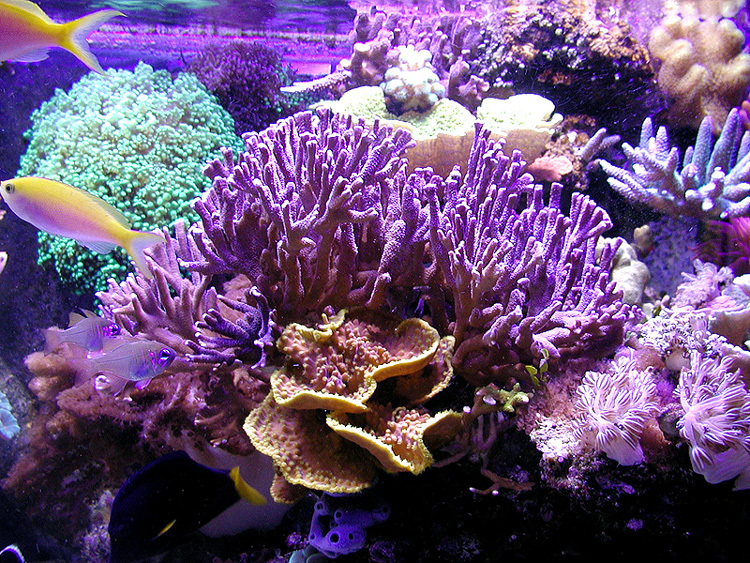 I don’t try to maintain a particular kind of biotope; rather I choose corals I want to look at. 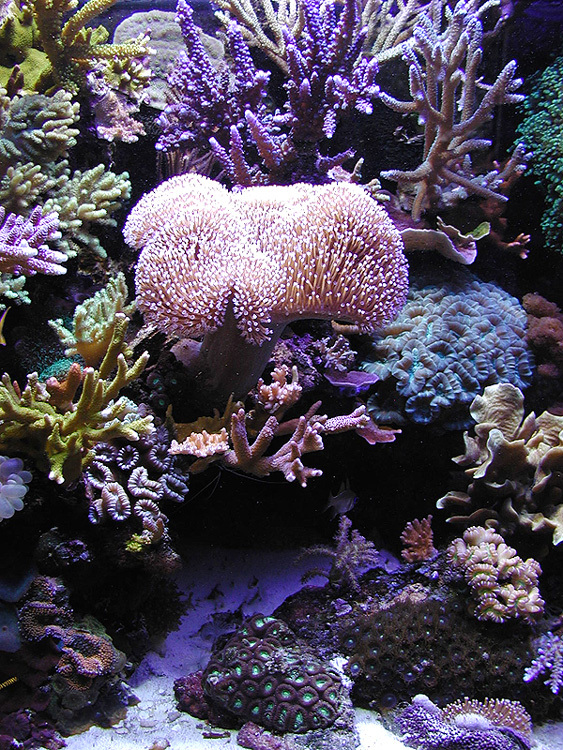 I try to buy propagated corals as often possible, I frag and trade both privately and to LFS, and if I am buying a Wild Collected coral I like to split it with at least one other reefer. 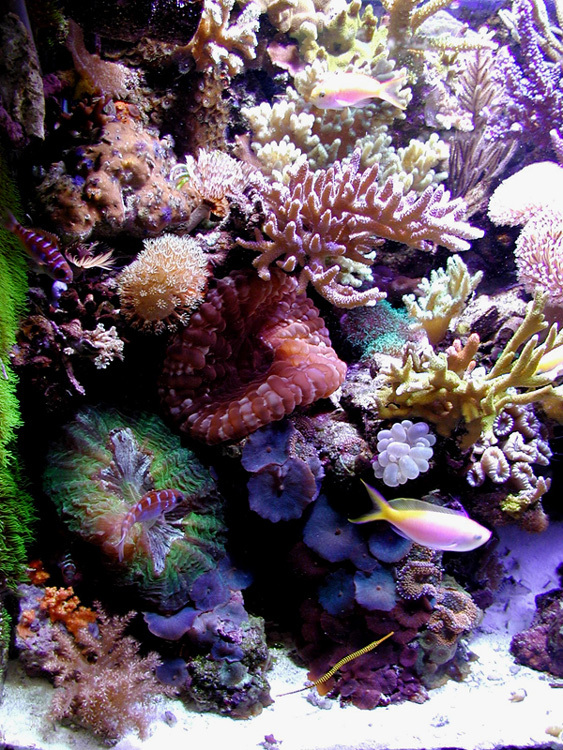 Thanks to RDO and Advanced Aquarist for their support over the years, and for including my reef as a featured aquarium. 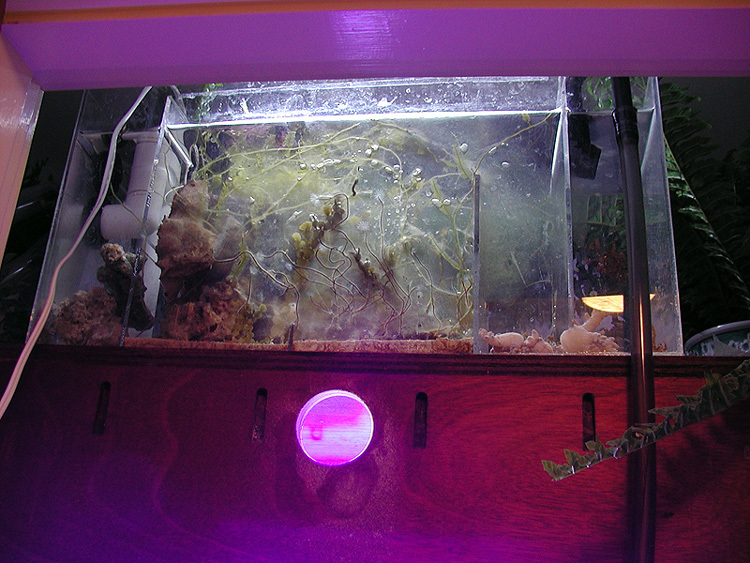 More information on this tank and my cuttlefish project can be found athttp://www.stickycricket.com/aquarium.